Squarez is a good example of how an extremely simple idea can be turned into a challenging, frantic, and addictive game that is more arcade than it is puzzle. 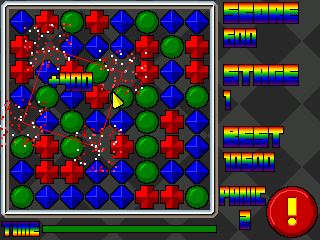 Your objective is to rack up as many points as you can before the timer runs out by spotting squares of the same colored pieces and clicking them to remove them. You are awarded more points if the square is diagonal, and even more if it's skewed. Gameplay here is flawless, clean, and admirable. Everything has been made to seem big, round-edged, and easily clickable, and nothing gets stuck or doesn't move or respond correctly at any point. It's very polished and your screen is organized, and the concept is such that you get better with each play just enough to motivate you to play again. The graphical polish alone here makes it worth checking out. Eliminated pieces explode with a flurry of flashing color, and new pieces slide smoothly in to replace them, bouncing a little when they reach their positions. The timer flashes when you're running low on time. Scrolling, changing backgrounds keep the screen from feeling static at any point, and there are even some bonus things it will say in the background when you score very high. As the screenshot shows, graphics and color scheme are used very well to create a great atmosphere for Squarez. I admire the sound effects in Squarez because they sound cartoony and exciting without ever getting annoying or boring, which is important in a game with repetitive play. As far as I know, they're original, and the game manages to get by with only about 5 of them, despite the amount of events they're used for. As for music, I was very sorry not to hear any, because some wacky techno music is exactly what would have perfected this amazingly professional arcade gaming atmosphere. I mentioned earlier that you improve each time just enough to motivate you to try again. This, logically, keeps you perpetually coming back for more, although I wish I could start seeing more elements of play, such as yellow pieces, or pieces with special properties (if there are, and I just missed them within the first four stages, I'd like to see them earlier in the game). It would also be great to have an online highscore table for Squarez, and I'm actually surprised there isn't yet, because EricDB is easily capable of setting a quality one up. Highs: Extremely good presentation as far as gameplay, sound, and graphics. Original, small, and addictive. Recommendations: The 10 people who like Squarez also like the following games. Although frusturating, Squarez can be fun in some ways. If there way a mode without time, I would have rated this better. I'vfe come in a situation where I found a square as soon as the time went up... and it really annoyed me. The sound is a retro-ish style, although not obnoxious enough to make you quit just because of a sound that repeats. I have honestly never heard these sounds before, and obviously didn't come from a GameMaker resource pack. This is too hard to play just for fun, I'm afraid. However, the graphics were more than amazing, and my favorite part of the game is the PANIC button, and how all the squares move around perfectly. I;m not sure how on earth you did that, but that was WAY TOO AWESOME! It reminds me of a Palm Pilot game that my aunt has... what was it calles... Jewls! Yes, I think it was called Jewels! Anyway, great job, albit frustrating. A 7 for you. Good job! It goes into full screen and then just freezes. I really like this game, and have for a while. The reason I rate this one high is because of the replay value; I can load this game up anytime and play it and it's STILL new and fun. Graphics are clean and very easy to view which I think is a must for a puzzle game. I've recommended this game to family and friends and they're all hooked. One of the games I'd recommend ANYONE try out. This is a great game, I LOVE it! terrific gameplay, and pretty nice GFX! I love this game! It is very fun and addictive. My high-score is 11,000,000.
download it! The only puzzle game i thought seemed interesting enough to download, and it was sooooo worth it! Very nice, kinda addicting little game. Looks very professionally done. And it's pretty fun. Definetely worth downloading.